Kia’s new midsize, three-row SUV will arrive in dealerships very soon, and the manufacturer just announced pricing for its three trim levels, which will compete with the Ford Explorer, the Toyota Highlander, the Honda Pilot and the Volkswagen Atlas, among others. The 2020 Kia Telluride EX will retail from $44,995 before freight and delivery charges, For that sum, the VUS serves up a power sunroof, a power tailgate, 18-inch alloy wheels, an infotainment system with a 10.25-inch touchscreen and Apple CarPlay/Android Auto integration, wireless phone charging, leather upholstery, heated and ventilated front seats as well as an intelligent key system. The EX trim level is also equipped with two rear bench seats for a maximum capacity of eight passengers. The $49,995 Telluride SX adds a surround-view camera system, a glass roof panel for rear passengers, automatic high beams, 20-inch wheels and a 10-speaker, Harman/Kardon stereo. We also get second-row captain’s chairs for a capacity of seven occupants. Finally, the $53,995 Telluride SX Limited will arrive a little later with features such as rain-sensing wipers, driver head-up display, Nappa leather seating as well as second-row heated and ventilated seats. 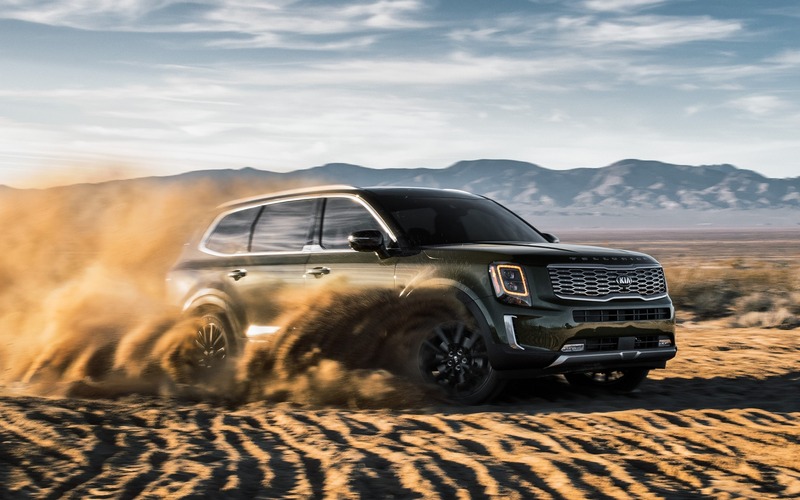 Every version of the 2020 Kia Telluride in Canada is equipped with a 3.8-litre V6 that develops 291 horsepower, an eight-speed automatic transmission and an all-wheel drivetrain. The usual suite of advanced safety features is also standard, which includes blind-spot monitoring, forward collision warning with emergency braking, lane-departure warning and lane-keep assist as well as adaptive cruise control.